HAVING leapt to fame on TV talent show I’d Do Anything, shortly after winning reality weight-loss programme The Biggest Loser, you’d think Jodie Prenger would be a fan of television that turns the public into stars. But she’s not. “I’m not a great fan of reality shows,” she says. “These people seem to be churned out and then gone in five minutes. Jodie had built a reputation as a performer in her home town of Blackpool long before she appeared on TV, and would sometimes perform in two different shows in different theatres on the same night. “I implore people to go along to these live shows rather than just watch TV,” she says. “I was doing this because I really enjoyed it but other people do it to become famous. Playing the tough female star of a wild west show alongside Wild Bill Hickok (Emmerdale’s Tom Lister) is a role she relishes. It’s keeping her fit and slim, something she relishes having first appeared on our TV screens as a dieter trying to lose weight. “I used to be 22 stone when I was about 23,” she admits. “Then I probably lost a bit too much but I’m at a happy medium now. But this show is like a workout so I don’t have to try too hard to keep the weight off. “All that whip cracking and gun-toting definitely keeps you fit. Jane is also a fantastic role – she was the original girl power icon. Apart from being an alcoholic, I’d love to be like her, she’s a great role to play. I come from a long line of powerful women – my mum, my gran, all of them. “Now we’re celebrating Calamity Jane as a powerful woman but back in the 1850s the real Jane would have been regarded entirely differently. In the show, Calamity Jane can outrun and outshoot any man in Deadwood. Hard, boastful and desperate to impress, she travels to Chicago on the Deadwood Stage to recruit a star, Adelaide Adams. But things don’t go too smoothly for Calamity, as everyone in town favours the new girl and she struggles to keep her jealously and pride in check. It takes her long-standing enemy Wild Bill Hickok to make her see sense, and realise her secret love. The score includes The Black Hills of Dakota, The Deadwood Stage (Whip-Crack-Away), Just Blew in from the Windy City as well as the award-winning Secret Love. 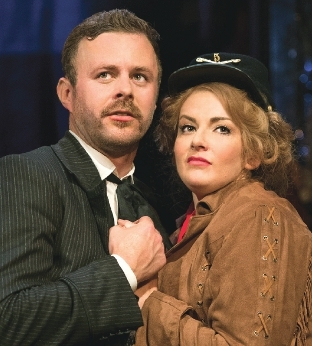 JODIE PRENGER stars as Calamity Jane at the New Victoria Theatre in Woking until Saturday (November 8).